Hello all and welcome to Converse NCAA's Friday Flashback. I was thinking about which direction I wanted to take this Friday and then it just came to me last night. I am starting mylast semester at the University of Kentucky on Wednesday. So this will be my last Friday Flashback before I am back in Lexington. While I will eventually cover the UK Denim Converse shoes and Jerseys, I thought I'd take a different approach today. 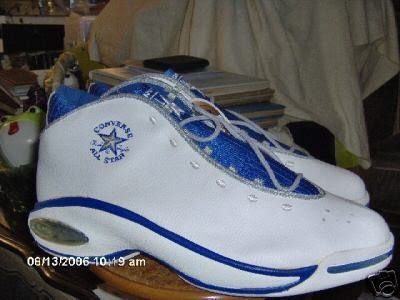 Today I want to focus on Kentucky's last Signature shoe, that just happened to come from Converse. 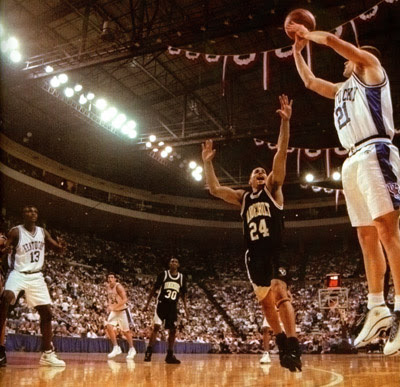 In the 1996-97 Season Kentucky dropped the Denim Jerseys and went to a more traditional look. That season players wore The Converse All Star 2000, Dr.J 2000 and the Converse All Star Hall of Fame. 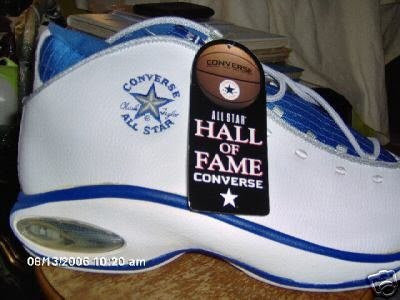 The Converse All Star Hall of Fame was a shoe made for the University of Kentucky. While it did come in other colorways to the best of my knowledge no other school wore them. This is an extremely clean shoe that looked fast even when it wasn't moving. I actually had these shoes but it was before I was a collector, so I have no idea where they got to. If I remember correctly they had React Juice in the heel. I really enjoyed the feel of these shoes. You got a really snug and comfortable feel with the inner heel tap area and the elastic straps in connecting the insoles to the tongues. I also really enjoyed the Chuck Taylor patch without the outer circle. I am pretty sure this was one of the only shoes that this design was used. The simple design was a nice chance of pace for Kentucky. In previous years Kentucky had worn Jerseys with cat scratches and denim colored shoes. 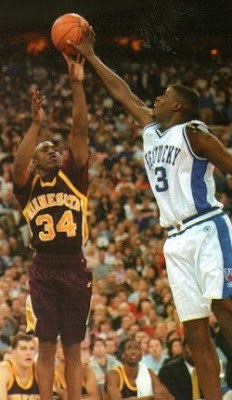 At the end 1996-97 season Kentucky lost in the Championship game to Arizona. However it was not all Kentucky would lose, soon Rick Patino left to coach the Boston Celtics. Then Kentucky decided to sign with Nike, ending years of tradition and individual attention received from Converse. Since then Kentucky has worn cookie cutter jerseys and shoes. This was no more evident then the recent jersey updates that seemingly every other Nike school received. Okay so that came off a little bitter, but oh well. Thanks for reading today's Friday Flashback, let me know what you think. If you remember these shoes, had these shoes, or anything else about these shoes, converse, or the blog please leave a comment. Thanks again and tell everyone about today's Friday Flashback. These were great shoes...it is sad that Wildcats didn't stay with Converse. I bet you still get a chubby for Tubby. I really need to get this shoe...it's one of my all-time favorites! Do you know where I can find a pair?? thank you for this post so long ago. i just was thinking about these shoes and searched the internet for longer then i'd like to say looking for at least a picture of them. i wish they still made these or would re-release them. Thanks for the Converse flashback friday thing... I'd been trying to find the name of those Kentucky Cons for ages!